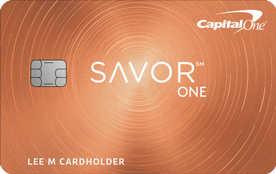 Capital One has expanded its dining rewards card portfolio with the launch of an enhanced Capital One® Savor® Cash Rewards Credit Card and a new Capital One® SavorOne™ Cash Rewards Credit Card. The upgraded Savor card offers 4 percent cask back on dining and entertainment purchases and a $500 new card member bonus when you spend $3,000 in the first three months, while the SavorOne card offers 3 percent back on dining and entertainment purchases and a $150 bonus after $500 spend in the first three months. Read on for more details on these cards, how they compare and what to consider before choosing one. Thanks to the Savor card’s generous rewards rate and sign-up bonus, cardholders stand to earn a high value from their rewards each year. If you eat out frequently and want to earn a generous rewards rate for doing so, this card is ideal. Also, along with offering a $500 sign-up bonus, the card does not charge an annual fee for the first year. Previously, the Savor card offered a $150 sign-up bonus after $500 spend in the first three months and did not charge an annual fee. Additionally, cardholders earned 3 percent cash back on dining, 2 percent back on groceries and 1 percent back on all other purchases. A new SavorOne card, which essentially mimics the original Savor card offer, has also been launched. The SavorOne card offers 3 percent cash back on dining and entertainment, as well as a $150 sign-up bonus after reaching the required spend threshold. If you want to earn bonus rewards on dining, entertainment and grocery store purchases, the SavorOne card is a great option. Additionally, those who plan to carry an account balance and/or transfer a balance from a different card can benefit from introductory APR on purchases and balance transfers. Besides sharing similar names, the Savor and SavorOne cards offer almost identical rewards structures. See what else we found when comparing the two cards. As you can see, you stand to earn a higher rewards value with the Savor card – at least in the first few years – making it the obvious choice for those who want to get the most value from their rewards. However, for those who don’t want to spend a large amount of money up front, the SavorOne card may be a better fit. If you’re interested in earning the most cash back in the first year, the Savor card is your best bet. By our estimates, the average consumer who spends approximately $15,900 in the first year on gas, food, clothing and general purchases, can earn $786 worth of cash back – compared to only $406 with the SavorOne card. While both cards offer generous rewards rates on dining and entertainment purchases, the Savor card has the edge – by 1 percent to be exact. At first glance, this may not seem like a substantial difference. But for those who spend a large amount of money eating out each month, the cash back can add up. For example, if you spend $1,000 per month eating out, you will earn $40 cash back with the Savor card and $35 cash back with the SavorOne card each month. With the Savor card’s $95 fee subtracted, this amounts to a $25 difference between the two cards by the end of the year. If you want to purchase a big-ticket item and pay it off over time, or you just plan to carry a balance on your card (though we recommend that you pay off your balance in full each month), the SavorOne card is the better choice. With the SavorOne card, you won’t be responsible for paying interest on purchases for the first 15 months of card membership. Once the introductory period ends, the variable APR on purchases will range from 16.24 to 26.24 percent. The Savor card, by contrast, doesn’t offer an introductory APR on purchases. If you have a substantial amount of credit card debt and are looking for a card that lets you transfer your balance without charging interest, the SavorOne card is the better choice. The SavorOne card offers an interest-free period of 15 months for balance transfers. After that, the variable APR is 16.24 to 26.24 percent. The Savor card does not offer a 0-percent intro APR on balance transfers. While the sign-up bonus for the SavorOne card is substantially lower than that of the SavorOne card, it requires a much lower spend threshold to receive it. The SavorOne card requires cardholders to spend $500 in the first three months to earn the $150 sign-up bonus – which averages out to approximately $167 per month for three months. The Savor card, on the other hand, requires $3,000 spend in the first three months – approximately $1,000 per month for three months – to receive the $500 bonus. Also, keep in mind that after the first year, you will be responsible for paying a $95 annual fee with the Savor card. New card members can begin applying for the SavorOne card and Savor card on Aug. 14, 2018. If you are an existing Savor cardholder, you will automatically be converted to the new Savor card. While you will begin earning the 4 percent cash back rate on dining and entertainment, you will not be eligible for the $500 sign-up bonus – which is only available to new cardholders. Additionally, existing Savor cardholders will not be charged an annual fee. See related: New Wells Fargo AmEx Propel card offers a 30,000-point bonus and up to 3x points, Which is the best card to use on Costco purchases?